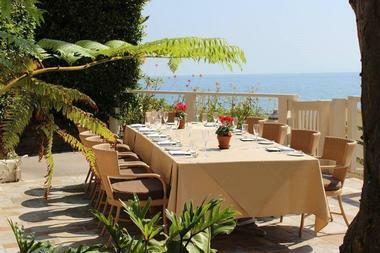 Romantic, luxurious and spectacularly beautiful, Malibu, California, is a unique beach town that so many rich and famous call home. With homes high up on the bluff overlooking miles of fine sand beaches and spectacular views of the Pacific, Malibu, CA, is known for its fantastic surfing waves, iconic fishing pier and great shopping at the Malibu Country Mart. 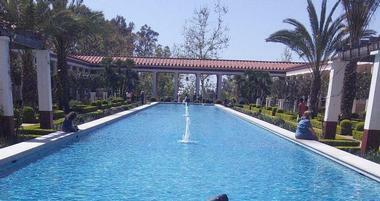 The Getty Villa is the former residence of Paul Getty, and is designed to resemble a 1stcentury Italian villa. It serves today as an educational center and museum that houses the J. Paul Getty Museum's collection of more than 44,000 Roman, Greek and Etruscan artifacts. The Villa serves as a campus for the UCLA/Getty Master's Program in Archaeological and Ethnographic Conservation. The permanent collection of 1,200 works is on view in 23 galleries, while five more galleries show changing or visiting exhibits. The Villa is surrounded by a large, beautiful formal garden filled with roses and trailing English ivy, with a number of Roman statues snuggled among the greenery. As you drive along the East Pacific Coast Highway through Malibu, you will not be able to resist stopping for a while and stepping onto the fine sands of Zuma beach. The largest, most beautiful and most popular beach in Malibu, this wide stretch of golden sand is perfect for swimming, building sand castles, playing beach volleyball, surfing and even fishing. There are lifeguards on duty and the beach has consistently received a high rating for its quality. There are several good restaurants nearby, from casual eateries to more gourmet meals. In the winter you can enjoy the view while hiking the ridge above the beach and watching the seals and dolphins. Much quieter than Zuma Beach, Malibu's Westward Beach is a three-mile-long sandy stretch of beach below the west side of Point Dume, with fine blond sand and clear blue waters. Sea cliffs sticking out into the ocean shadow the beach below, perfect for swimming, sunbathing, surfing and fishing. There are showers, restrooms and picnic tables, as well as the popular restaurant The Sunset. 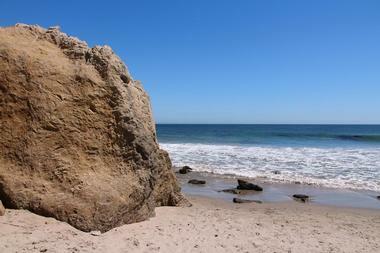 There are several hiking trails leading from the beach up to Point Dume Natural Preserve. Nearby Pirates Cove Beach is hidden behind the high cliff wall. Westward Beach is also great for spotting sea lions, seals and dolphins who like to visit the area. 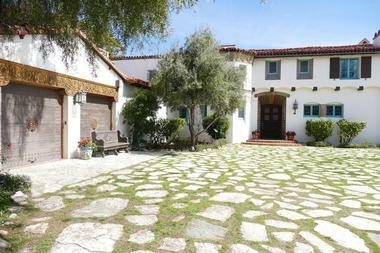 Adamson House is a Spanish Colonial Revival-style house with spectacular views of Surfrider Beach and lush landscaped grounds, built in 1929 for the affluent Rindge family. The house is covered with beautiful tiles in rich blues, greens, yellows and oranges created in the renowned Malibu Potteries, and is located on the beach and surrounded by a high chain-link fence for privacy. Guided tours of the house provide a rare opportunity to see the way of life and the history of Malibu at the beginning of the 20th century. The Malibu Lagoon Museum is located next to the Adamson House and contains a rich collection of artifacts, photographs and rare documents telling the story of the colorful Malibu history. The museum covers the periods from the era of early Chumash Indians to the times of Spanish California. Did you ever wonder where the rich and famous who call Malibu home shop for their groceries? The answer is: In Malibu Country Mart, right in the Malibu Civic Center. The Country Mart is a 6 acre unique mix of high-end shopping, playing and dining, where you can get pampered, fix your car, get a designer gown for tonight's party, have a fancy meal or check out the latest show at the gallery. This 'boutique mall' or 'lifestyle center' has a range of buildings of mixed Spanish, modern, Mediterranean and rustic styles. The buildings are surrounded by beautiful gardens dotted with original sculptures, picnic areas, kids' playgrounds and outdoor restaurants. Point Dume State Beach is a beautiful sandy beach shadowed by overhanging headlands and cliffs, with romantic rocky coves and vast expanses of soft white sand. It is perfect for swimming, scuba diving, surfing and fishing. It is a popular spot to look for California gray whales during their migration period between December and April. A mild ascending hiking trail takes hikers to a unique accumulation of coastal bluff sand dunes. The bluff offers spectacular views of the Santa Monica Bay, Malibu Coast, Santa Monica Mountains and Catalina Island on a clear day. There is a boardwalk near the summit with a viewing platform and a stairway on the east side that leads to some small isolated beaches and occasional tidepools. Malibu Pier is a 780 foot long fishing pier located next to Malibu's Surfrider Beach, the center of surf culture in California, a cheerful, festive heart of Malibu oceanside. The beach is famous for its natural three-point break that creates waves of up to 300 yards. 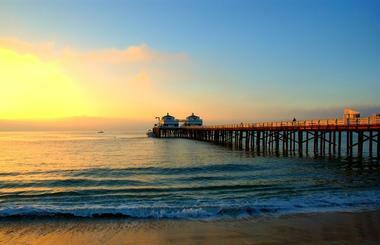 The pier is a favorite spot for watching surfers ride the waves, cheering them on and fearing for them when they fall. The Malibu Pier is dotted with the brackets for fishing rods and reels and there is always someone patiently waiting for a fish to bite. The pier is also a pleasant place for a stroll, especially just before the sunset. There are several restaurants on the pier, offering fish and seafood, wine, cocktails and great views. What started in 1948 as the old Geoffrey's, the destination for stars such asFrank Sinatra, Marilyn Monroe, Shirley MacLaine and Lana Turner, designed by the famous architect Richard Neutra, grew into a modern, chic California restaurant that continues to be a popular spot in Malibu for special occasions. Spectacular views of the ocean from the outside terrace and the elegant indoor dining room compete with the artistry that comes from the Executive Chef Bijan Shokatfard's kitchen. If you come for brunch, be sure to try the heavenly Ahi Tuna Tartar with avocado, ginger, scallions, Tobiko caviar and Wonton crisps. 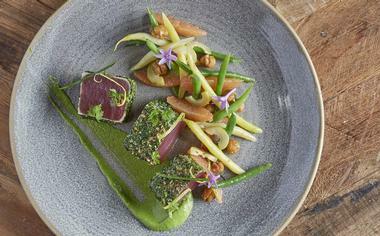 The menu is heavily focused on seafood and is paired with a superb wine selection. With vast ocean all around you, having an adventure on the water while visiting Malibu is a must. Malibu Coastal Adventures can organize an exciting day for everyone, which could include a boat trip, surfing lessons, paddle boarding lessons, fishing trips, scuba diving explorations, whale watching or just a pleasant cruise along the beautiful Malibu coastline. You can learn to paddleboard or surf, catch the biggest fish of your life, see the elusive whales or frolicking dolphins and get a unique view of the exclusive expensive properties of the rich and famous. You will be in the safe hands of Captain Dave Ogle, a licensed U.S. Coast Guard Certified Captain and his team of surfing, paddle boarding and kitesurfing instructors. Of course you can go hiking, biking or sightseeing on your own while in Malibu, but what are the chances that you will see just the right spots or discover all the interesting landmarks and hidden treasures? 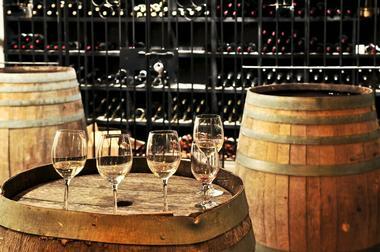 Why not let the knowledgeable and passionate local guides show you the most interesting neighborhoods and take you on exclusive visits to some of the best wineries. Good2Go Adventure Tour team will organize the transport, book the visit, create the fun itinerary and tell you all about the neighborhoods you are passing through. 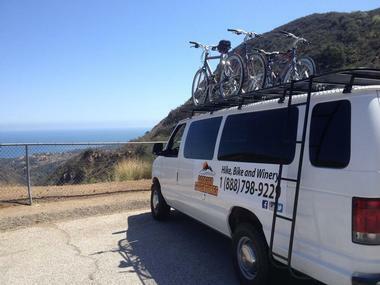 The most popular tour, The Malibu Vino Run, includes a visit to three wineries and tasting rooms, a terrific picnic lunch, a stop for some live music off the Pacific Coastal Highway and a lovely scenic drive with stops for the best views. This beautiful state Park is a coastal area named after the actor, preservationist and conservationist Leo Carrillo. Known best for playing Pancho in the TV series Cisco Kid, Carrillo went on to serve on the California Beach and Parks Commission for 18 years. His namesake park consists of a 1.5-mile-long stretch of beach that is perfect for swimming, surfing, windsurfing, and beachcombing. Tide pools and coastal caves are hidden along the picturesque coastline. The area also contains shady campgrounds, a large network of backcountry trails, and a collection of interpretive displays. 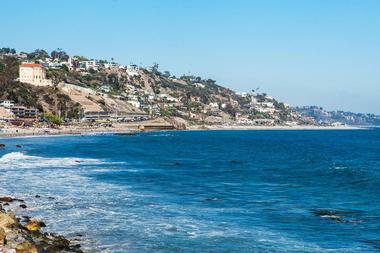 Malibu Divers is the one-stop shop for diving enthusiasts in the Malibu area. 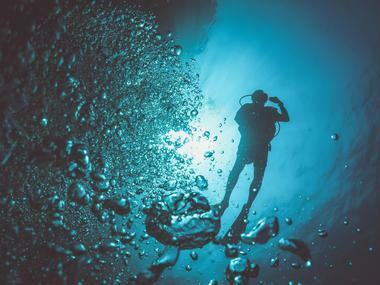 The company offers diving courses that cater to beginners as well as experts. Guided dive trips to nine popular Southern California islands and reefs are also available through Malibu Divers, and the company can help divers organize charters for special trips in the waters off of Southern California. Many of the trips are package deals that include food, lodging (if applicable), and transportation. Lastly, Malibu Divers has resources and training for free divers, rescue divers, and children who are just getting into the sport. At the on-site store, divers can pick up equipment, manuals, dive logs, and more. This 6.9-mile-long trail runs through Leo Carrillo State Park in Malibu, California. The trail is considered 'difficult' since it includes 1,664 feet of elevation gain and some rocky, steep terrain. The highlights of the hike include the beautiful plant life, views of the local grasslands and the Pacific Ocean, and a seasonal pond located off of the trail. 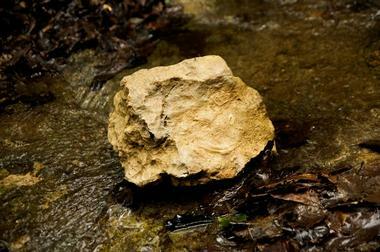 There are spots along the trail where hikers can access secluded beaches and quiet campgrounds. For guests who want to turn the hike into an overnight trip, the area contains more than 130 campsites for groups of all sizes. Picnic tables, barbecues, restrooms, and coin-operated showers are available at each trailside campground. 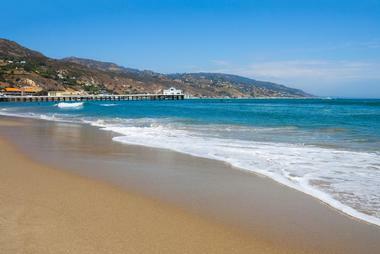 Known as Point Zero among local surfers, Nicholas Canyon Beach is a popular hangout spot in western Malibu. The idyllic setting is an ideal place for surfing, swimming, wading, scuba diving, windsurfing, and beachcombing. Aside from a small parking fee, the beach is free to the public. There are picnic tables, restrooms, showers, and spaces for sitting. During the summer there are lifeguards on duty and food trucks that park in the area for beachgoers. The main parking lot for Nicholas Canyon Beach is easily accessible from the Pacific Coast Highway. It is a well-kept secret of the Santa Monica Mountains that hidden within are some great wine-making estates that produce unique varietals and superb vintages. Hidden Malibu Wine Country Tours takes groups from a single couple to 500-people on private exclusive visits to some of the best vineyards in the area. The luxury transport ranges between SUVs for up to six people and luxury busses for large groups. Crystal chandeliers hanging from the huge old trees, fine linens on the beautifully set dining tables on the lush green lawn, combined with the sweet smell of barbecued meats and lively chatter of happy people – that is the Malibu Café. It is a day-long fiesta on the old Calamigos Ranch started by the Gerson family 50 years ago that has evolved into what the new team calls "nouveau barbecue." 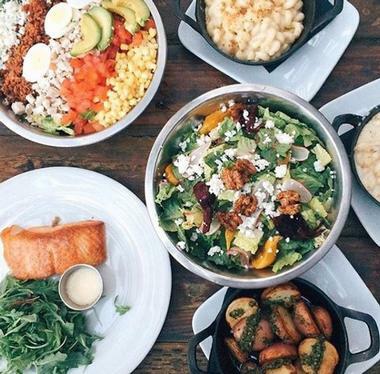 You might come for the famous brunch to try some of their delicious Huevos Rancheros or Eggs Benedict, but you may end up playing shuffleboard with total strangers or throwing a frisbee to someone's dog. It is a classic old-fashioned California Cowboy and Cowgirl country party you do not want to leave. No wonder they have so many weddings here. 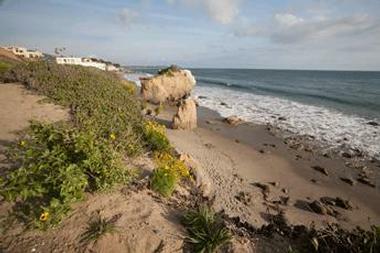 Robert H. Meyer Memorial State Beach is situated between Leo Carrillo and Point Dume State Beaches. The site is comprised of coves known as pocket beaches with names like El Pescador, El Matador, and La Piedra. All of the picturesque beaches are suitable for surfing, beachcombing, relaxing, and bird watching. About 10 miles away from Malibu on the Pacific Coast Highway, the three pocket beaches draw crowds during the summer but tend to be quiet in the off-season. 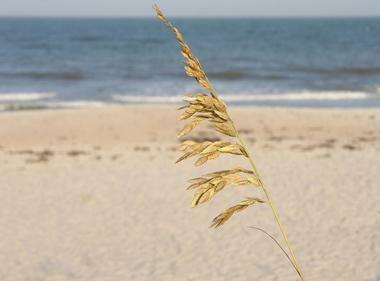 There are designated parking areas as well as paths that guide visitors to each beach. 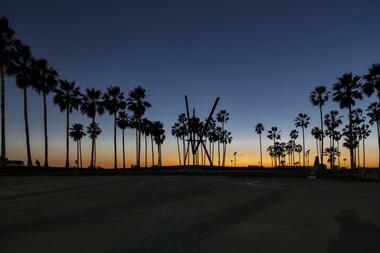 Next read: 25 Best Things to Do in Los Angeles. Located about 50 miles away from downtown Los Angeles, Circle X Ranch is a popular hiking destination for locals and visitors alike. The ranch used to serve as a Boy Scout camp, but it is now open to the public. 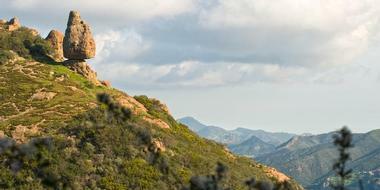 Its main attraction is Sandstone Peak; the highest peak in the Santa Monica Mountains. On clear days hikers can spot Anacapa Island, the Channel Islands, Santa Cruz Island, and Mount Baldy. Trails running through the ranch also provide hikers with the chance to see the unique plant and wildlife that inhabit the coastal area. There are spots within Circle X Ranch for camping and picnics, as well. Filled with rich history, the Zuma and Trancas Canyons are home to an interesting assortment of plant and animal life. Deer, rabbits, and coyote all roam among the flowing streams and dramatic peaks that surround the area. The canyons once belonged to Frederick and May Rindge, a couple who christened the area Rancho Malibu and turned the land into private property. After a long struggle with the government, the couple had no choice but to allow the construction of the Pacific Coast Highway on their land. Even though Zuma and Trancas Canyons once hosted human inhabitants, they aren't highly developed. Visitors can access the canyons by traveling along the Pacific Coast Highway. In the canyons there are areas for hiking, biking, picnicking, horseback riding, and more. Malibu Lagoon State Beach, also known asSurfrider Beach, is located in the Santa Monica Mountains National Recreation Area. The 110-acre coastal area was designated as a state park in 1951. Today it is known as one of the best surfing beaches in the entire state. 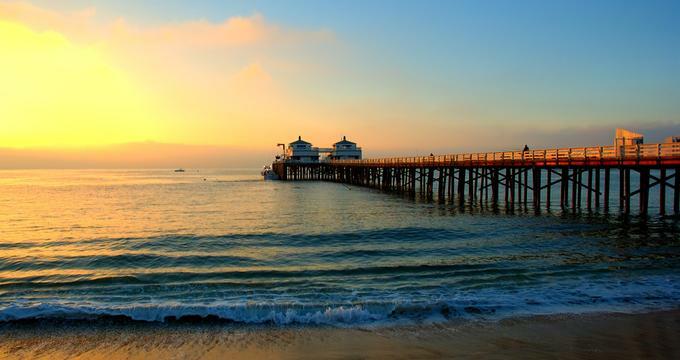 One of its most well-known features is the Malibu Pier, which attracts scores of saltwater fishing enthusiasts every day. Other nearby attractions include the Adamson House, the Malibu Lagoon Museum, and the wetlands area. Guests can stay entertained by swimming, scuba diving, snorkeling, boating, wildlife viewing, or venturing along the hiking trails in the nearby hills. 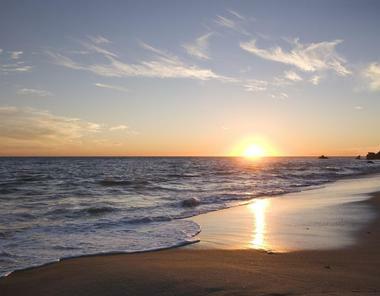 Point Mugu State Park, a five-mile-long stretch of beautiful coastline, is located within the Santa Monica Mountains. Rugged hills, pristine beaches, two large canyons, sand dunes, and lush valleys are some of the main attractions in the 40,000acre park. 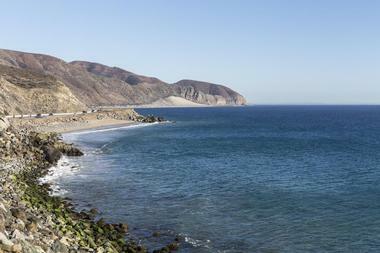 More than 70 miles of hiking trails zigzag across the interior and coastal parts of Point Mugu State Park, and there are spots for swimming and surfing. 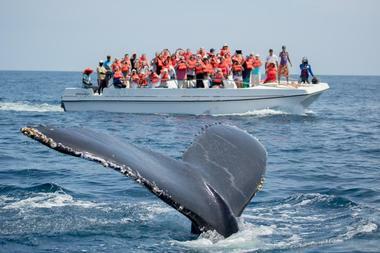 Winter visitors occasionally will catch glimpses of migrating whales. The park has two designated campgrounds called Thornhill Broome and Sycamore Canyon that are open for tent camping as well as trailer camping. When you combine spectacular ocean views, sleek, modern decor and exquisite delicacies produced by celebrated 'Iron Chef' NobuMatsuhisa, you get near perfection. 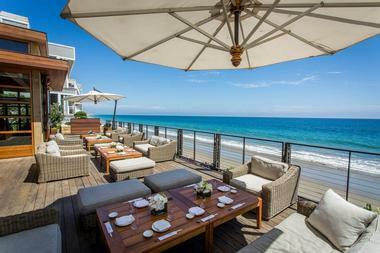 Nobu Malibu's new location just off Pacific Coast Highway has floor to ceiling windows and a spectacular deck with endless ocean views, an exterior upstairs lounge and a fourteen-seat bar. Chef Nobu brought with him his signature dishes like Black Cod Miso and Tiradito. Executive Chef Gregorio Stephenson has his own treats on the menu such as Ribeye with Truffle Butter Sauce. If you have a celebration coming, book right away as the restaurant is typically booked at least a month in advance. 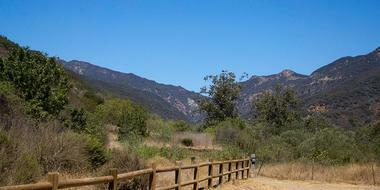 Topanga State Park is comprised of picturesque cliffs and canyons in the Santa Monica Mountains. With 36 miles of trails that wind through grasslands and forests, the park is a popular destination for hikers, bikers, and horseback riders. 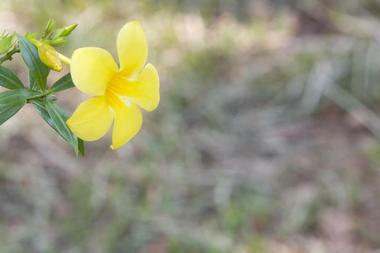 It is thought to be the world's largest wildland that sits within the limits of a major city. Most of the main attractions in Topanga State Park are accessible through Trippet Ranch, a site that leads out to the Eagle Spring loop trail, Hub Junction, the Temescal fire road, and the Musch Trail. Some of the hiking paths provide stunning views of the Pacific Ocean and the rugged California coastline. Located in the Santa Monica mountains, Solstice Canyon is an intriguing historical site surrounded by tall waterfalls. Visitors can take an easy two-mile-long hike to access the site. A strenuous six-mile-long hike also leads into Solstice Canyon. The main attraction in the canyon is the shell of a stone house that dates back to 1865. Built by Matthew Keller, the stone house is thought to be the oldest existing stone building in Malibu. The house withstood several major wildfires, but it was ruined by the 2007 Corral Fire. Some of the walls are still standing. 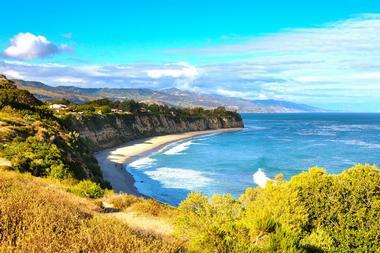 Visitors can also access the beach from Solstice Canyon, which makes it a popular spot for picnics and family outings. Your slice of Hawaii in California, Duke's Malibu is so close to the ocean near Malibu Point that you can expect to be splashed occasionally. Duke's is dedicated to Duke Kahanamoku, famous swimmer, surfer and Hawaii's ambassador of Aloha, who popularized surfing in North America and the world. Beautiful ocean vistas, colorful cocktails with umbrellas, a thatched roof and surfboard décor create a funky, laid-back atmosphere popular among locals and tourists alike. Hawaiian specialties are served in the large, bright dining room, and the more casual Barefoot Bar downstairs offers great maitais and tacos, while the cozy veranda with small, romantic tables is perfect for sunset watching and happy hour socializing.